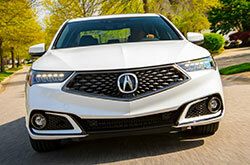 What Does the New Acura TLX Offer? 2018 Acura TLX - What's New? The 2018 Acura TLX in Peoria returns to our dealership with a variety of enhancements that give the luxurious sedan a more refined and sophisticated look than ever before. For starters, the frontend has been refreshed to include a genuine mesh grille. The front fenders have also been redesigned, and the powerful V6 version of the model has a new look at the rear. Discover all that this lavish sedan has to offer in our 2018 Acura TLX review below. 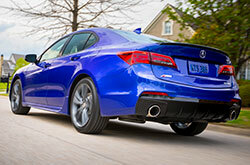 The new TLX is offered in base, Technology and Advance Trims. Starting with the base, it comes with ambient interior lighting, dual-zone automatic climate control, leather-like upholstery, heated front seats and driver memory settings. Like before, the infotainment system features dual screens; however, the 7-inch display screen now features capacitive touch for easier use. Also standard are Bluetooth phone and audio connectivity, a seven-speaker audio system and satellite radio. On the outside, there's LED headlights and taillights, a sunroof, heated side mirrors and sporty 17-inch alloy wheels. If the above amenities are not enough, 2018 Acura TLX reviews recommend stepping up to the Technology package. 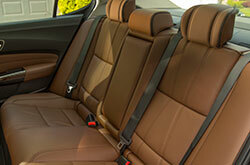 It adds leather upholstery, navigation and a 10-speaker sound system. V6 models also get fitted with new 19-inch wheels that only add to the sedan's appeal. Buyers of the 2018 Acura TLX in Peoria will have the choice between two engines. At the bottom of the power pyramid, there's a 2.4-liter four-cylinder engine that delivers brisk acceleration, delivering 206 horsepower and 182 pound-feet of torque. It comes with an eight-speed automatic that sends power to the car's front wheels. More power can be had with the V6 variant, which delivers 290 horsepower and 267 pound-feet of torque. It gets a nine-speed automatic transmission that delivers brisk acceleration. All-wheel drive is also offered on all V6 models. All TLX models come standard with AcuraWatch suite, which includes lane keep assist, forward collision warning, automated emergency braking, adaptive cruise control and lane departure warning. A luxurious sedan that exudes elegance and sporty style, the 2018 TLX is a sure bet for those who want top-notch amenities and high-powered performance. 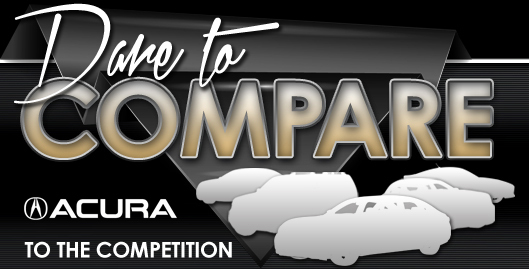 Stop by Acura of Peoria today for a test drive! 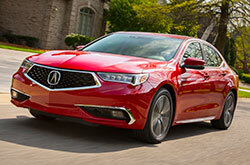 Want More Details on the Acura TLX? The esteemded 2018 Acura TLX should be on your list, especially if you've been shopping for the 2018 Audi A4, Cadillac ATS, Infiniti Q50 and the Volvo S80 near Phoenix. Its bounty of cutting-edge features and finely crafted styling may be just what you need from a car. After you are finished our 2018 Acura TLX review and check out the comparison tool, view financing and leasing incentives offered at Acura of Peoria. As your resident car dealer, we're the location to go if you want to find the well-liked Acura TLX. When selecting a car, it's pivotal to make a self-assured choice; that's why we've included this 2018 Acura TLX review an ideal fit on our site. You will be blown away when you visit Acura of Peoria to test drive the Acura TLX; we welcome you to come experience the model up close. Also, prior to your visit, you can see its polished design from all angles by watching our video walk-around. Purchase prices do not include tax, title, license and $499.00 doc fee. Prices include listed incentives. Please verify all information. We are not responsible for typographical, technical, or misprint errors. Inventory is subject to prior sale. Contact us via phone or email for more details. *MPG Based on 2018 EPA mileage ratings. Use for comparison purposes only. Your mileage will vary depending on driving conditions, how you drive and maintain your vehicle, battery-pack age/condition, and other factors.